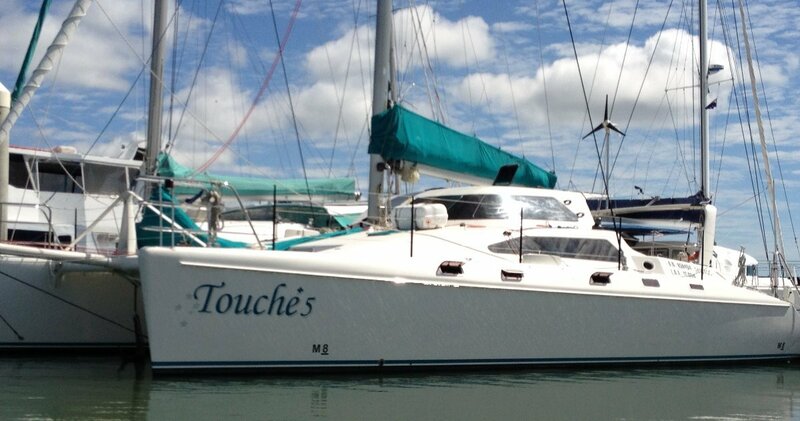 Just presented to the market Touche5 has been built to a very high standard and it would be a challenge to find a Farrier F41 to match her. 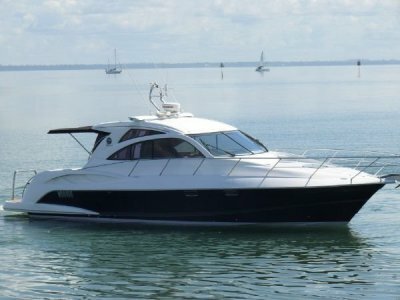 These boats were first built in 2002 and impressed from the start with comfort and speed. Further refinements were made true to the Farrier principles. The saloon is slightly higher and wider than design spec which was later adopted by Farrier in subsequent designs. This boat is built to USL code and material used is Corecell foam, woven glass of various weaves and epoxy resin supplied by ATL Composites. High density Corecell was used inhigh stress areas. The layout comprised three double cabins and one single with ample storage. Single helm station offers two flexible positions, quality Harken deck hardware and Allyacht rotating mast are testiment to the commitment the owner has made to using the best equipment throughout the build. A comprehensive inventory and photos will be available soon however interest is encouraged to make contact as this vessel is amazing value. Very realistically priced. Please contact Mike on 0407 911 010. 2 separate toilets/showers. Tecma Electric. 140 Litres holding tanks each. The configuration is galley down with a sink and fridge, stove & oven. A mini-galley is situated up in the saloon, with a second sink & the storage of all eating utensils. Four burner gas stove (Bosch) with installation to marine standards with stainless steel on all surfaces with an extraction fan above the stove. Fridge's are by Iceer and Ozefridge 2. External Weber Q.
Manson Supreme and winch is a Sprint Lawrence with 30 metres of 10 mm gal chain and 70 metres of anchor rope. Spare anchor is a lightweight Fortress with chain and rope as required by MSQ /AMSA. 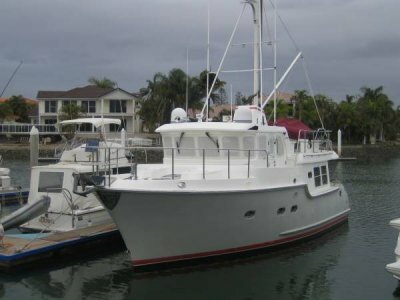 Lithium -3 x 160 amp hour batteries with a dedicated 240v by 30 amp battery charger on shore power and at sea by a Fischer Panda DC 250 amp by 12v diesel charger. 2 x 180 watt flexible solar panels on the roof and Airex wind generator mounted on the Targa. Xantrex battery monitor. 240v outlets throughout. 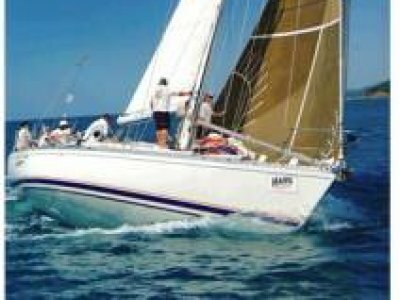 Square top mainsail and jib are Hydra Net (Spectra) with 3 reefs in the main and one in the jib both built by Neil Tasker of Barracouta Sails. 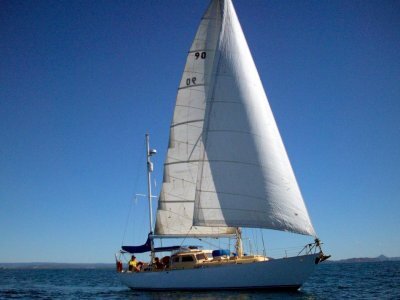 The screecher(UK Halsey Sails) furled by a Bartels unit on an endless cord on the foredeck. Commercial registration with certificates of compliance for design, stability, electrical inspection, build. However never been used for such purpose aand would only require the safety equipment to be audited.